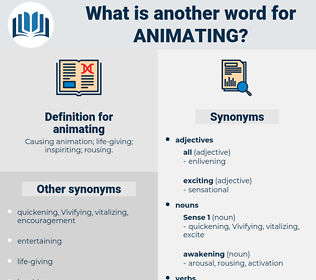 What is another word for animating? 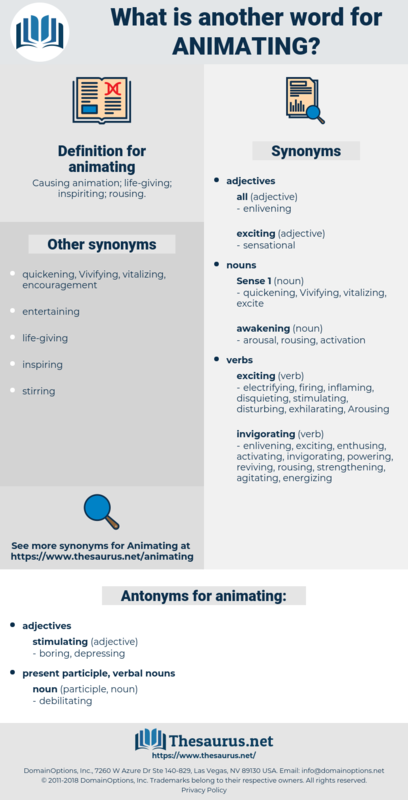 Causing animation; life- giving; inspiriting; rousing. Yet here, as well as everywhere else in the threatenings and promises of the prophets, we must beware, lest, in referring them to some particular historical event, we lose sight of the animating idea. Behind the cosmic process men feel there must be a creative power, an animating impulse. Andaman Sea, Anemone Tetonensis, antimonious, anathemise, animate thing, antonius, antonymous, anatomise, anatomize, antimonic, anthemis, anthonomus, antinomasia, anathemize, annotating, antoninus, animateness, Anything, anatomic, antitank, anointing.